It is interesting that there seems to be more technology advancement going on today with flat pedals compared to clipless pedals. 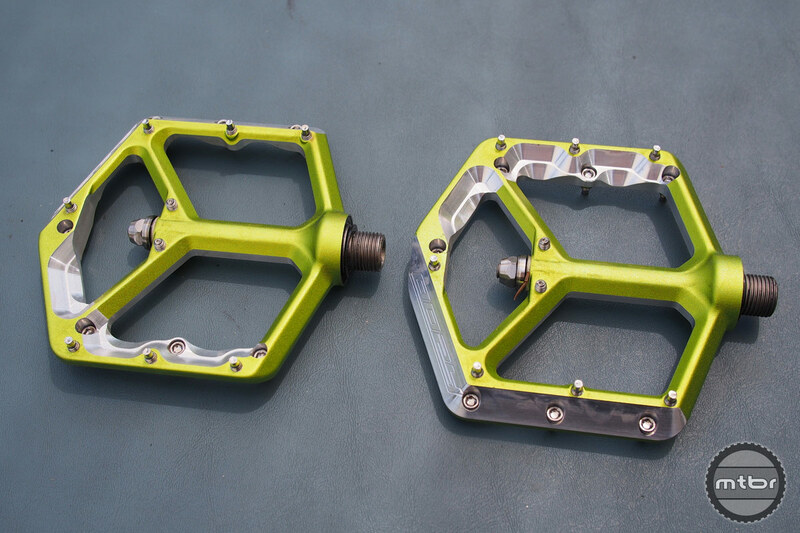 Although clipless pedals has a cleat retention system with a locking mechanism, springs, float and release systems, the landscape seems to be dominated by Shimano and a distant second is Crank Brothers. And these systems haven’t changed much in the last decade. 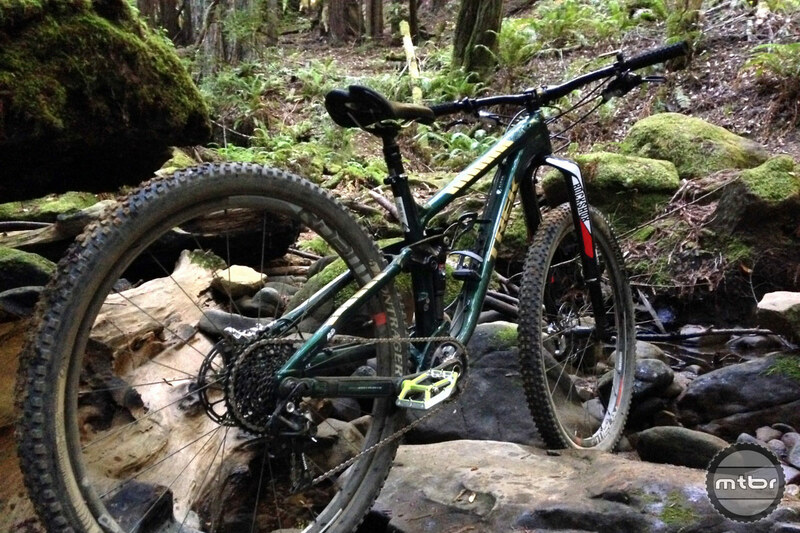 There seems to be a growing trend of experienced riders venturing out to try flat pedals for trail riding. And beginner riders aren’t necessarily forced to ‘graduate’ from flat pedals to clipless pedals as they gain experience. 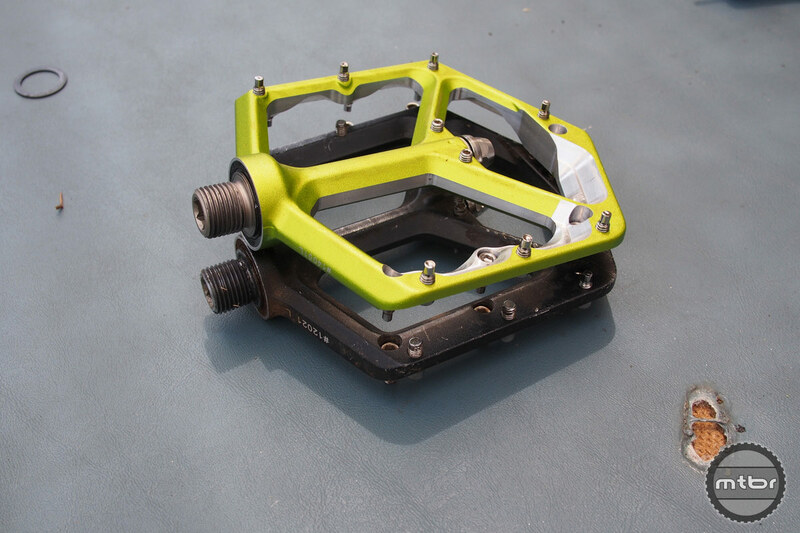 Flat pedals are holding their own now as reliable and efficient tools for any kind of riding. Its appeal seems to be two-fold. First is the rider can release from the bike instantly. Since the rider is not locked on to the bike, the rider can put a foot down or jump away from the bike when needed. It is quick, consistent with no training needed. But the other more intriguing appeal is riding flat pedals train the rider to ride in harmony with the bike instead of yanking on it and fighting it. Since the rider is not locked on to the bike, he’s forced to use proper weighting and loading/unloading techniques to maintain contact and pressure on the bike. And these tools allow the rider to handle the bike more fluidly and safely. 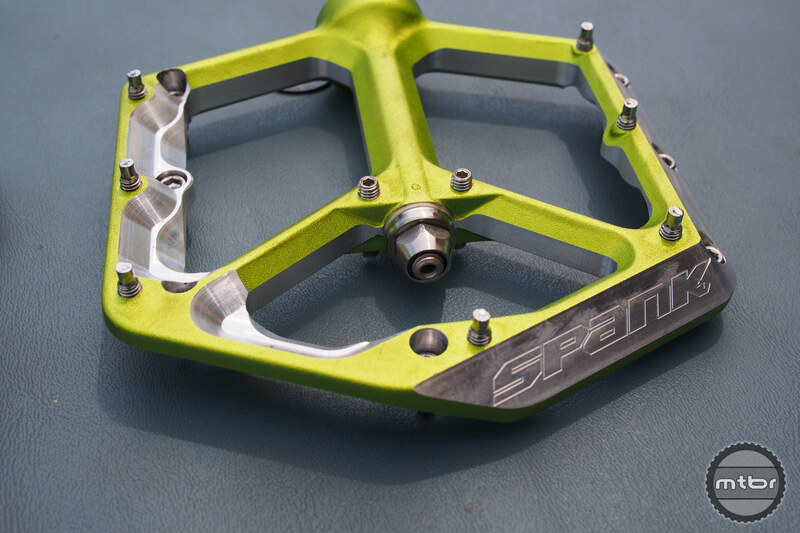 One of the most successful flat pedals introduced in recent years is the Spank Spike pedal. The only issue was the Spike was a bit overbuilt and heavy for XC and Trail use. 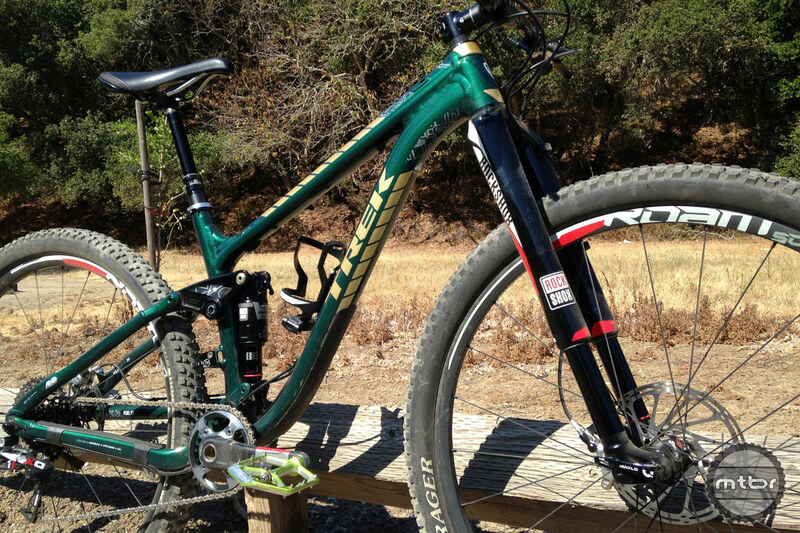 So Spank just released the Oozy Trail which is lighter and exhibits most of the same great qualities of the Spike. The pedal body is beveled and polished toward the edges to give a nice look and to provide a finish that will survive the countless rock hits that it will encounter. Most pedals with an anodized finish look like a war zone of color and bare metal after just one season of riding. The outer edge of the pedal is chamfered as well so there is no 90 degree outer corner that will hit a rock obstacle head on. The angle of the outside edge helps deflect the blow away from the bike. Now it still is a big pedal at 90 sq cm of surface area. This will help the rider avoid shoe hotspots and the dreaded ‘pedal flip’ when the foot is not in the ideal position upon landing or impact. One downside of this pedal is it requires a flat washer on the pedal axle when installing on to most cranks. This is not a big deal if you never have to move your pedals from bike to bike. But in our case, we’ve lost the washers many times and we’ve been left with a bike that’s unrideable since the pedals bind without the washer. 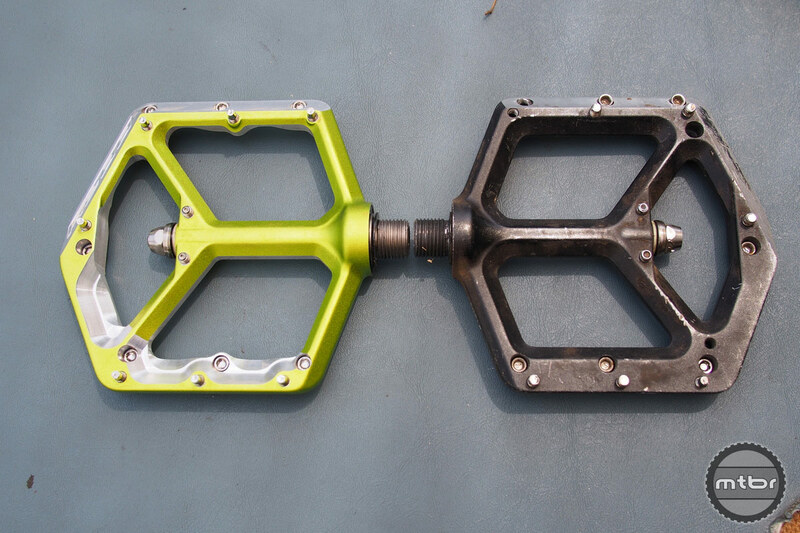 Oozy Trail and Spike pedals side by side. 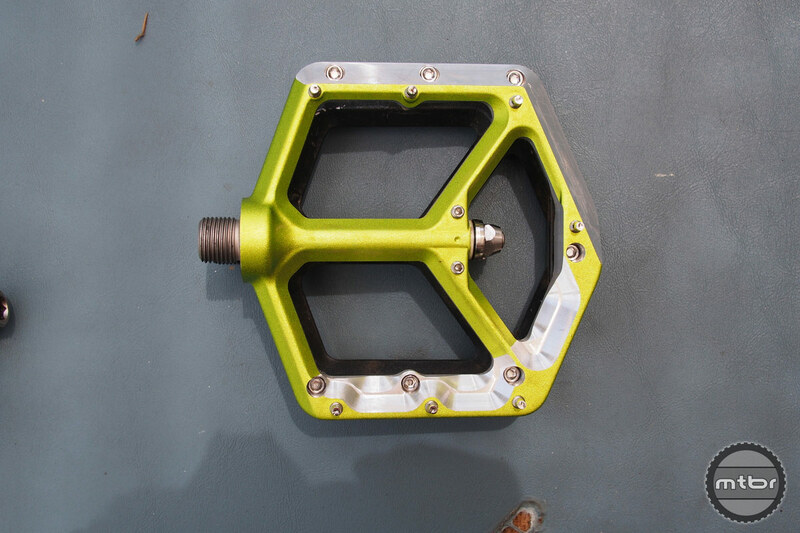 The goal was to take the iconic shape and function of the Spike pedal, and optimize it in every way to create a light weight, massive platform pedal, for today’s all-mountain/aggressive-trail/enduro riders. To achieve this Spank opened a new optimized forge mold for weight and improved the traction pins with machined tips to reduce their weight and improve grip. 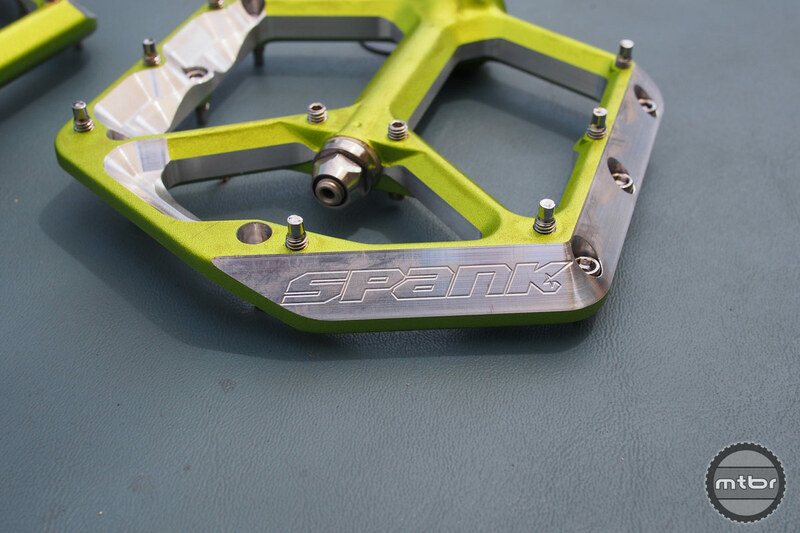 As a final touch, Spank added CNC machined logos to the bodies replacing the printed ones on the Spikes, and giving a really classic and durable look. Thinner Pedals obviously provide a few mm of clearance over thick ones, which is most certainly appreciated on rough terrain. However, the biggest benefit of thin flats for most riders is actually the positioning of the foot (and your weight) so close to the pedal axle. By reducing the space between your foot and axle to less than 2mm, you effectively eliminate the triangulation of force between your foot and the axis of rotation, making balance over the pedals easier, and improving your pedaling efficiency. This not only enhances the feeling of grip on your pedals, but also reduces the pedals tendancy to “flip” (leading to painful shin and calf strikes). Weight of the Spank Oozy Trail pedals. 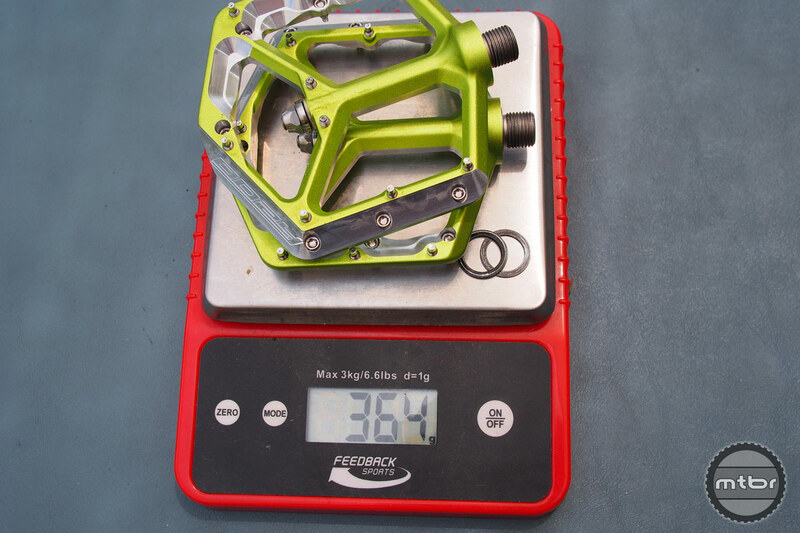 Sealed industrial bearing has been upgraded in 2014 for both Oozy and Spike Pedals, with improved seals (note the bright green outer seal which should always face towards the crank), and with Finish Line Brand Teflon (TM) Lubricant. A second “Friction Seal” is used on the inboard side of the bearing, which further protects from contamination and helps to reduce unwanted “freespin” in the pedals without undue drag. On the outboard end, an IGUS polymer bushing is used to keep the pedals spinning smoothly. IGUS bushings are remarkable in that the self lubricating material is not only hard enough to resist impact damage, but also easy and affordable to replace should the need ever arise. The IGUS bushing is protected from the elements by a Stainless Dust Cap enclosed O-ring seal. 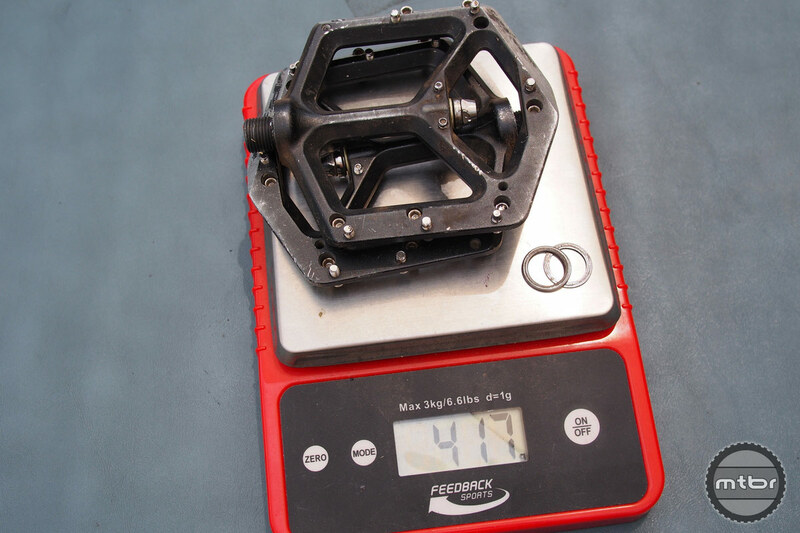 Weight of the Spank Spike pedals. By eliminating the wrench hex face from the pedal axle, (meaning an 8mm Allen Tool must be used for mounting pedals) we reduce the spacing between the full compliment sealed industrial bearing and the crank, reducing leverage on the bearing to a minimum. This step also serves to reduce the Q-Factor or spacing between the riders feet while pedaling, improving pedaling efficiency. For more information visit www.spank-bikes.com. That weight listed in the specs doesn’t jibe with the pictures. What’s the real weight supposed to be? I’d say 360 and 364 is pretty close? I loved my Spikes, so the Oozy should be even better! 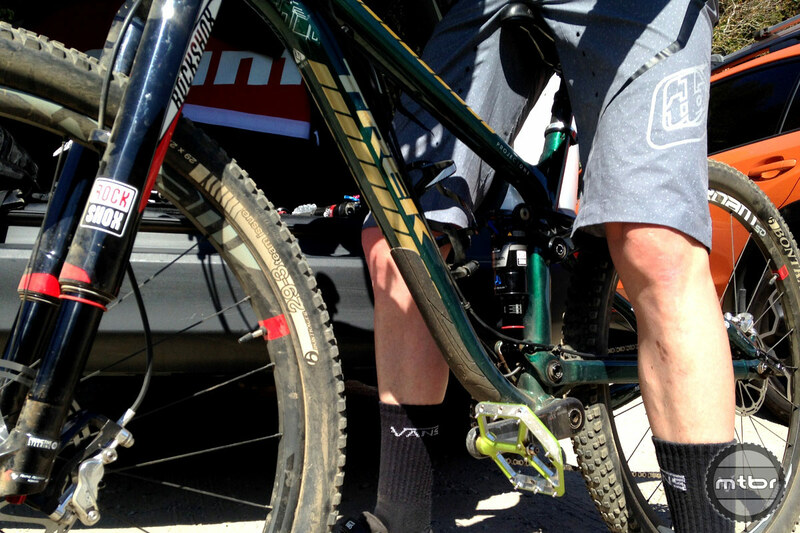 However, I run the XX1 carbon cranks and use a protective boot on the crank ends. The large flange of the Spank/Oozy interferes with the boot even using a spacer washer, so just beware of that issue. The pedals look pretty decent but are definitely overpriced. After years of clipless I went back to flats and run Xpedo Spry pedals. AT 260 grams they are lighter than the eggbeaters I was running and very, very grippy. For a magnesium pedal they seem to be pretty tough. I run them on both fs and ht bikes. Rock strikes mark them up pretty good but they continue to work flawlessly. BTW: I bought 2 sets of Sprys for the price of the Spanks. Funny, I feel like I ride in harmony while being connected with my bike via my clipless pedals.